Last week, our inaugural group of hope-holders & truth-tellers began our 30 Day Writing Challenge together. We wrote toward a prompt about our earliest childhood memories. It's been a joy and an honor to watch stories pour out of those participating - so many stories to be told! I wanted to share a few excerpts from their pieces with you today. I've kept all the quotes anonymous, since some memories are particularly personal. Days later, we are at our community swimming pool. I watch my mother shed her clothes, revealing her one piece bathing suit. Revealing her bruised thigh. I see the large blueish-green markings on her leg and somehow, at two, I know. I know it was him, that night. I know it was the weight of us falling against the metal. I connect her pain and his anger and me in the middle, threading a broken tale of fault. I believe it is because of me." "I am not sure if any of these things were really as I recall. At times they are a vague feeling and sense, and at others, very clear and certain. For a time I did not cherish them. I did not think they were unique. Now I know. I know they are different from others childhoods. I had a wildness that is not found everywhere. A chance to be barefoot. A chance to be innocent. A chance to listen to raindrops." "Life is all about relationships. Material items only fulfill you for so long, adventures alone only satisfy the soul temporarily, but add a friend, or a sibling, or a partner and the moments, adventures, and places become more meaningful, leaving a deep impact on our hearts. As soon as I had my first baby I knew there had to be a second. I may mess up half of parenting, but to give my daughter a brother was the best gift I could offer her." Every little girl adores their dad - I did too. It isn't surprising that my earliest childhood memory includes my dad. A moment in time so long ago, perched in his arms as he carried me out of the woods. Being chosen is what stands out in my mind as I recall this memory from my childhood. A moment in time when my dad was present and choosing to be near. It's just that, a moment, because the reality is, He wasn't always present in my life in a real way. Yet it's a very symbolic memory for me, reminding me I'm chosen every day by my Creator and Heavenly Father. Although my dad didn't always choose to make me a priority, I've always been a priority in the eyes of my Creator and it's in God that I find my identity, significance, and worth. The perfect image of a father that God portrays allows me to have grace and look beyond my dads failures. Realizing my dad didn't always chose to be present and outwardly express his love provides clarity. Clarity to my story because not always being chosen by my dad impacted where I looked for significance and worth. As I dig deep and attempt to put my story into words, I'm discovering freedom and redemption and that is enough to keep me writing. Aren't these lovely? Personal stories are such beautiful treasures, to both the writer and the reader. What would your story look like in words? 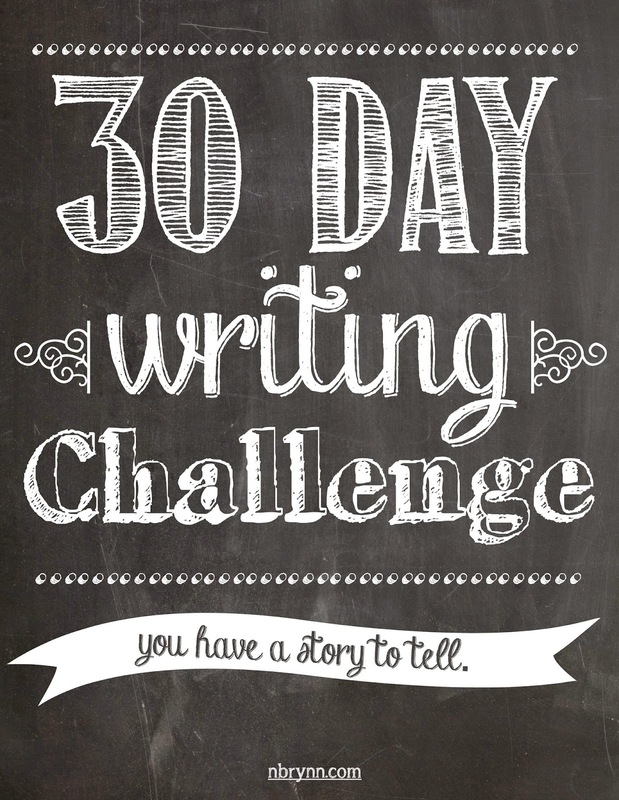 Join me for our next 30 Day Writing Challenge (starting in April) and find out!